Consider relocating exposed pipes to provide increased protection from freezing. When the weather is very cold outside, let the cold water drip from the faucet served by exposed pipes. Running water through the pipe - even at a trickle - helps prevent pipes from freezing. Recognized as a leading fire and water cleanup and restoration provider by hundreds of insurance companies nationwide, SERVPRO® of North Tulsa County Professionals offer fast, reliable biohazard cleanup to residential and commercial property owners. Exposure to biological and chemical contaminants can pose serious health consequences for building occupants, employees, customers and owners. A failure to properly handle and safely remove such hazardous substances can contribute to unhealthy and even dangerous environments. Your local SERVPRO® of North Tulsa County Professionals are trained to safely and effectively remove bio hazardous substances and prepare waste for proper disposal according to OSHA, EPA and state and local health regulations. Equipped with the necessary safety equipment and cleaning products, SERVPRO® of North Tulsa County Professionals help turn unsafe environments into clean, safe homes and offices. *State and local regulations vary. 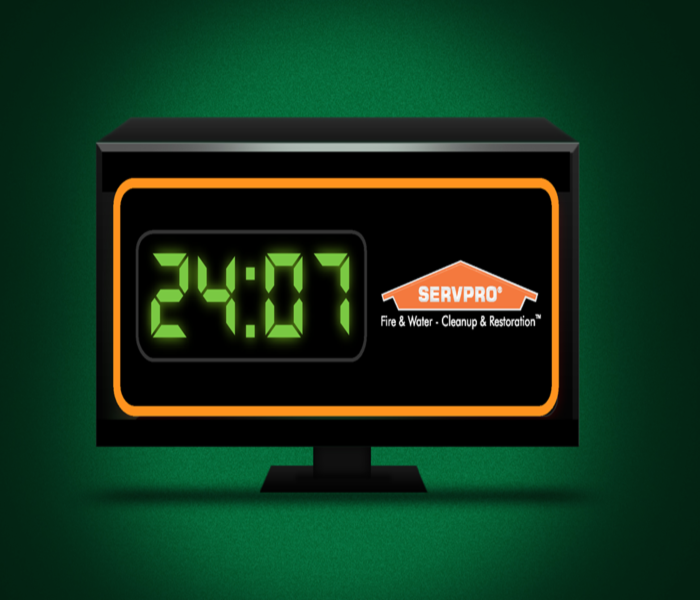 Contact your local SERVPRO® of North Tulsa County Professional for 24-hour Emergency Service. 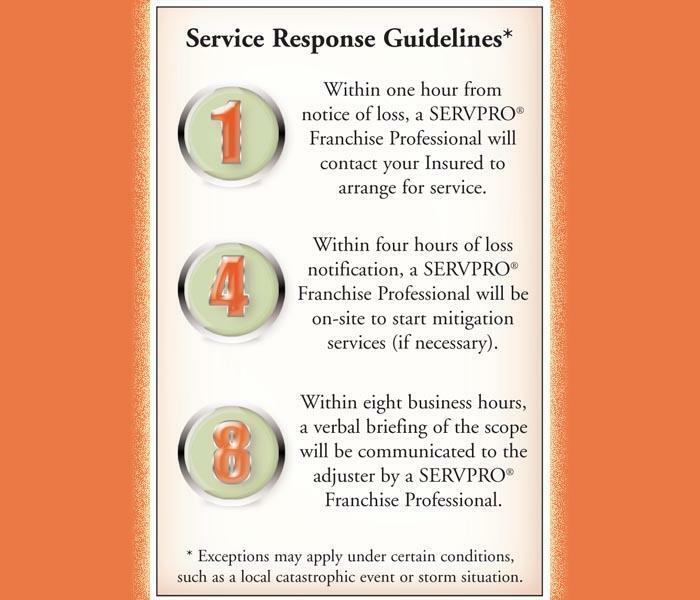 Within one hour from notice of loss, a SERVPRO® Franchise Professional will contact you to arrange for service. Within four hours of loss notification, a SERVPRO® Franchise Professional will be on-site to start mitigation services. Within eight business hours of on-site arrival, a verbal briefing of the scope will be communicated to the appropriate person. When water damage is left untreated, mold growth quickly occurs. Contact SERVPRO of North Tulsa at the first sign of water damage. If you’ve ever been curious about where a certain odor was coming from and almost went crazy looking for the source, there’s a chance it might have been caused by water damage. But how does water damage cause such foul smells, and what can you do about them? SERVPRO of North Tulsa provides large-scale restoration services and has experience dealing with this issue. Here, they explain a few ways odors can occur and how you can handle them. Although it often starts out as merely a nuisance, water damage worsens over time. Seeping water can lead to the growth of mold and mildew, which is when foul odors start to emerge. Water triggers mold to release spores, creating a sickening stench. Odors can also be a result of other contaminants. For instance, when a sewer backs up, the resulting smell comes from the sewage that’s inside your home. So, what can you do about it? Well, this is one mess you definitely shouldn’t try to clean up yourself: Water damage, especially at the level where it’s producing odors, always calls for a professional touch. Additionally, if there’s any form of sewage present, you’ll need professional sewage cleanup services to remove all the hazardous and toxic materials. The same is true for mold cleanup. And remember: It’s important to call an expert right away. So whether you just noticed a leak or your home recently sustained a flood, now’s the time to contact a specialist. If you wait, the damage could become more expensive to repair and may harm your health. SERVPRO of North Tulsa County is available 24 hours a day for water emergencies, large or small. When you are dealing with water damage, immediate action is crucial. A delay of just a few hours can greatly increase the severity of the water damage. We understand that when you call us, you may be feeling confused, stressed, and vulnerable. You need an expert to guide you through this crisis. SERVPRO of North Tulsa County has the specific water damage training and experience to help you through this tough time. We specialize in water damage restoration—in fact, it's the cornerstone of our business. SERVPRO of North Tulsa County specializes in the cleanup and restoration of residential and commercial property after a fire, smoke or water damage event. Our staff is highly trained in property damage restoration. From initial and ongoing training at SERVPRO’s corporate training facility to regular IICRC-industry certification, rest assured our staff is equipped with the knowledge to restore your property. Each and every person that works for our office strives every day to ensure that all our customers, no matter the job, have positive feedback at the end of our work. Our main concern is ensuring that we complete your job with complete satisfaction and ensure that it is as stress free as possible. Each one of the jobs above were so different: a death cleanup, water/mold remediation and fire damage cleanup and restoration; but the main outcome was our satisfied customers and their ability to be back in their home "Like it never even happened." We are here to take care and help not only your home, but you as individual by making this process as simple as possible. *Without thermostat controls, deep fryers can overheat oil to the point of starting a fire. *Even a small amount of cooking oil spilling on a hot burner can cause a large fire. *An overfilled cooking pot will cause oil to spill when the turkey is put in, and a partially frozen turkey will cause the oil to splatter when put in the pot. If you do decide to venture into the land of deep frying, just remember these things when planning your holiday menu. Happy deep frying!!! When fire, water, and mold damage take control of your life, we help take it back! Contact your local bright green clean up team to help you get your life back! Give SERVPRO of North Tulsa County a call today! 918-371-0222! BE AWARE: Check the forecast before participating in outdoor activities. If it calls for any thunder, postpone any outdoor trips or activities! AVOID WINDOWS, DOORS, PORCHES, AND CONCRETE: Do not lie or lean on concrete floors and walls! Lighting can travel though any m...etal wires or bars in concrete walls or flooring. AVOID WATER: Do not bathe, shower, wash dishes, or have anything in contact with water during a thunderstorm because lightning can travel though a building's plumbing. AVOID ELECTRONIC EQUIPMENT: Do not use computers, laptops, game systems, washers, dryers, stoves, or anything connected to an electrical outlet. 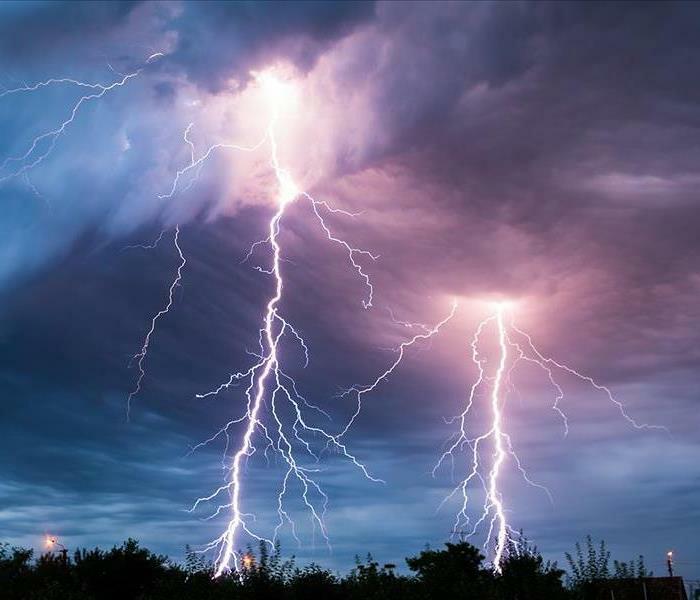 Lightning can travel though electrical systems, radio and television reception systems, and any metal wires or bars in concrete walls or flooring. Equip homes and offices with whole-house surge protectors to protect appliances. Faster Response & Faster Clean-Up is Money Saved For You! What separates SERVPRO from other restoration companies? Our 1-4-8 protocol! -Within 1 hour from notice of loss, a SERVPRO Franchise Professional will contact you to arrange for service. -Within 4 hours of loss notification, a SERVPRO Franchise Professional is starting mitigation/restoration services. -Within 8 hours of on-site arrival, a verbal briefing from a SERVPRO Franchise Professional. The benefit for you as a Homeowner or Business Owner is faster response, faster cleanup and money saved. 5/31/2016 - Take YOUR Life Back! 4/21/2016 - Faster Response & Faster Clean-Up is Money Saved For You!